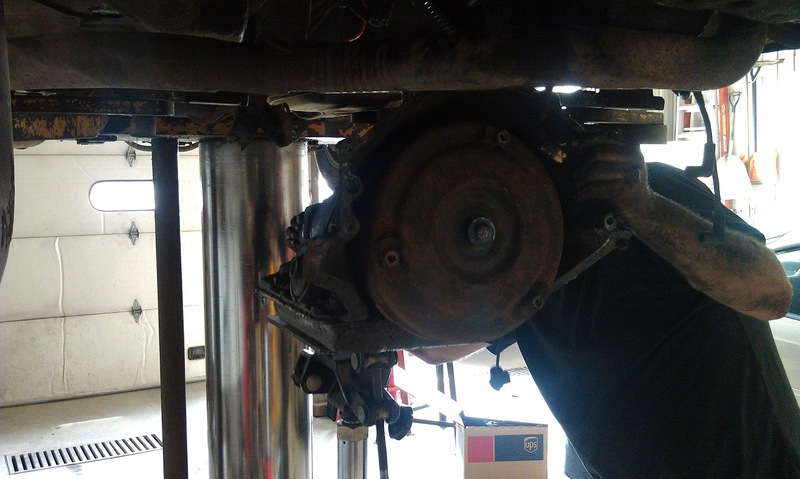 Troy lined the hoist up. 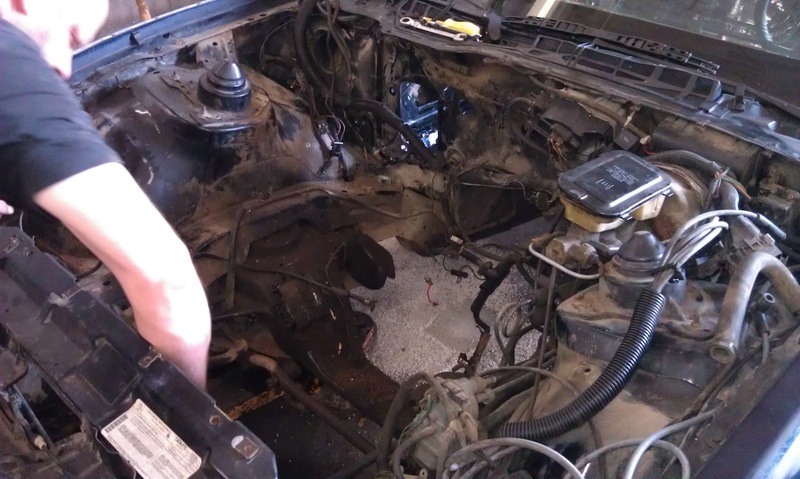 One last look at the engine bay before we started. 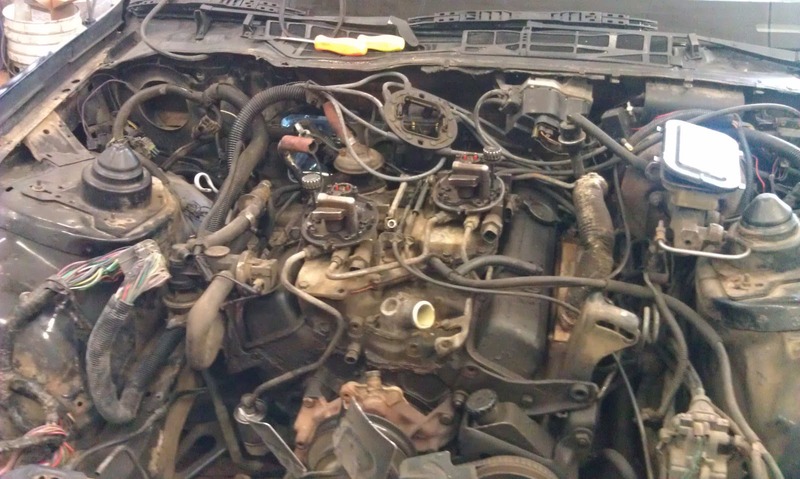 Got the wires out of the way in preparation for engine removal. 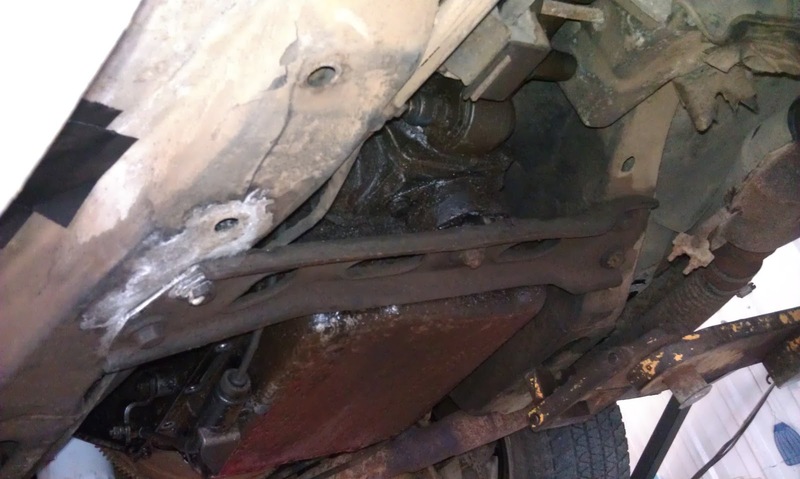 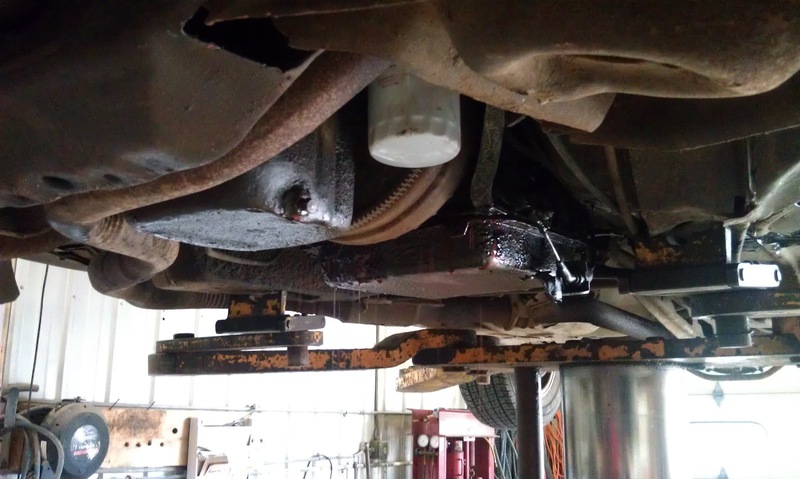 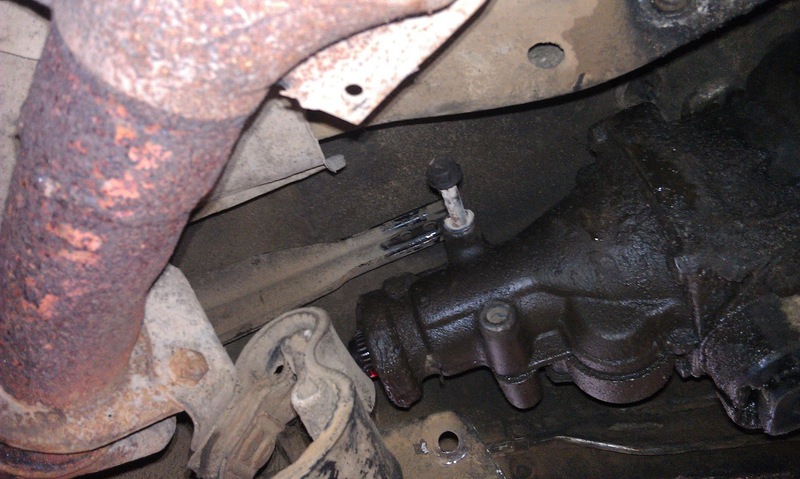 We loosened the bolts on the transmission pan to allow the remaining fluid to drain. 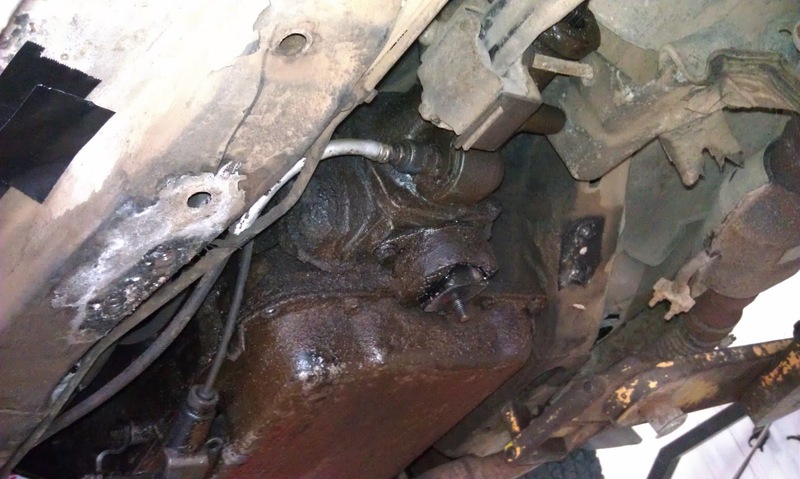 I will need to replace the transmission pan, most likely with an aluminum one. 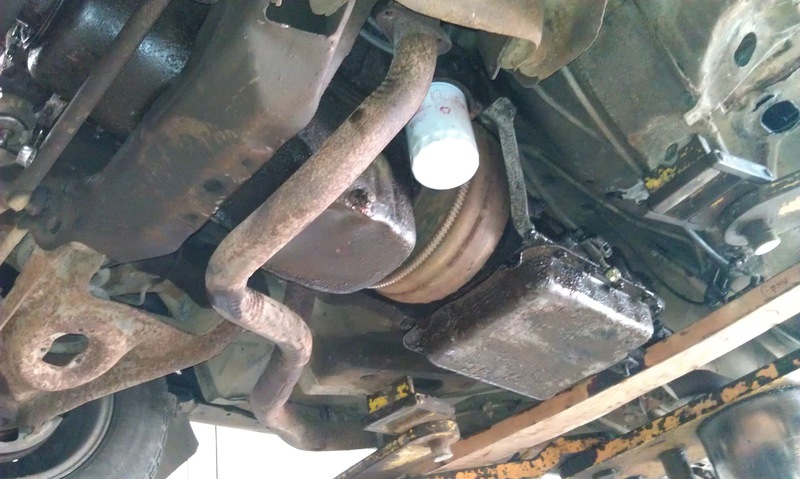 Troy recommended aluminum because of the heat dissipation properties and impact resistance. 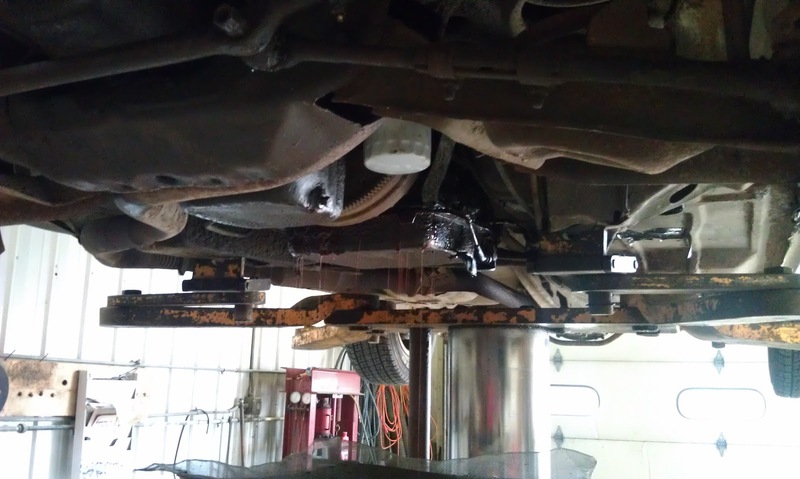 I enjoyed a Dew while we waited for the fluid to finish draining. 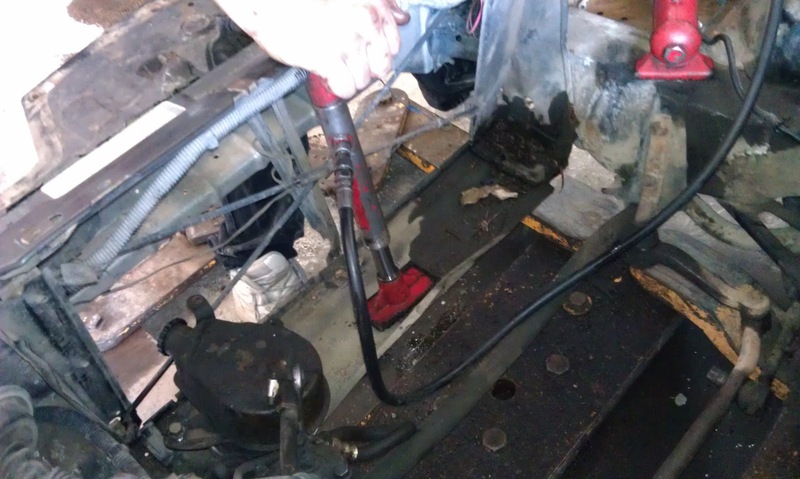 We adjusted the shift cable. 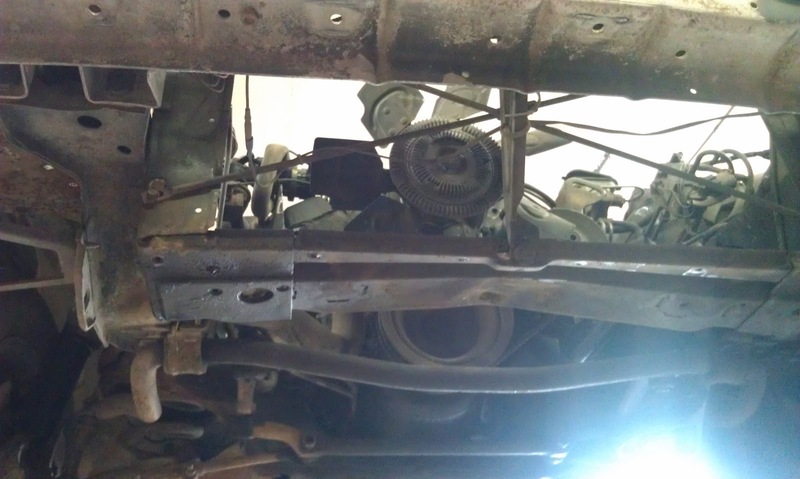 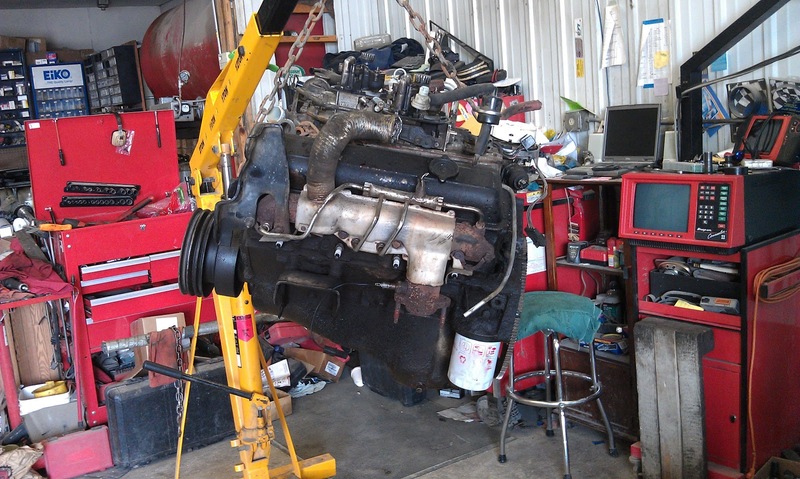 The next step was to remove the transmission mount. 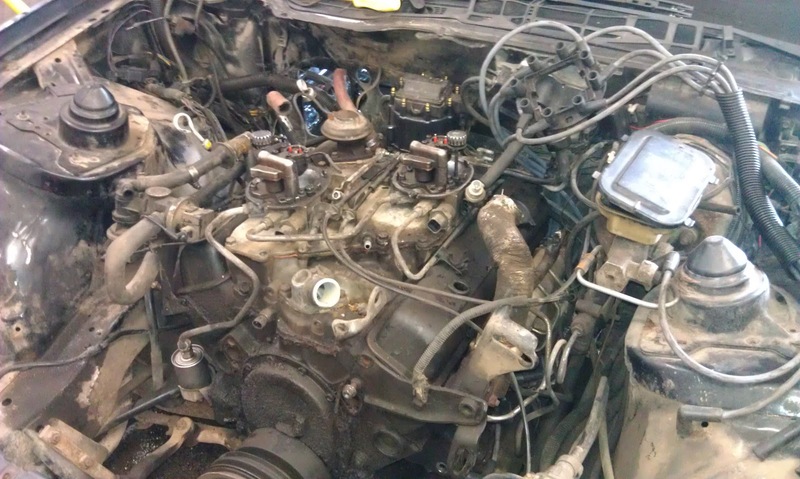 Four bolts down, one to go. 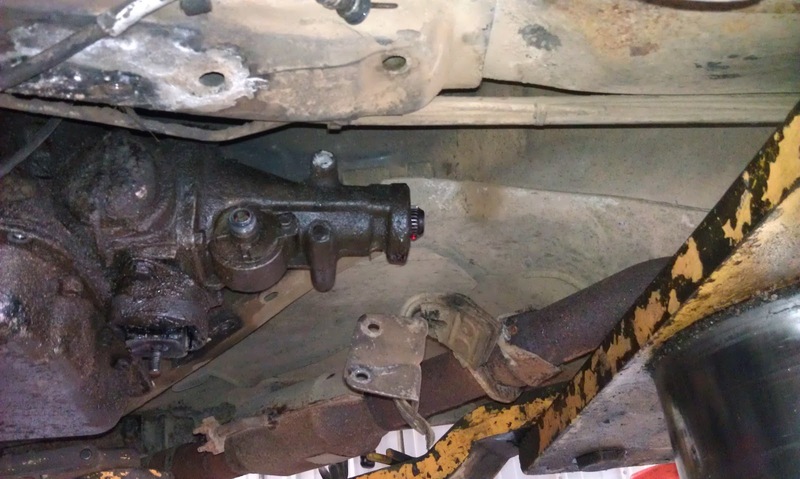 The transmission mount is off. 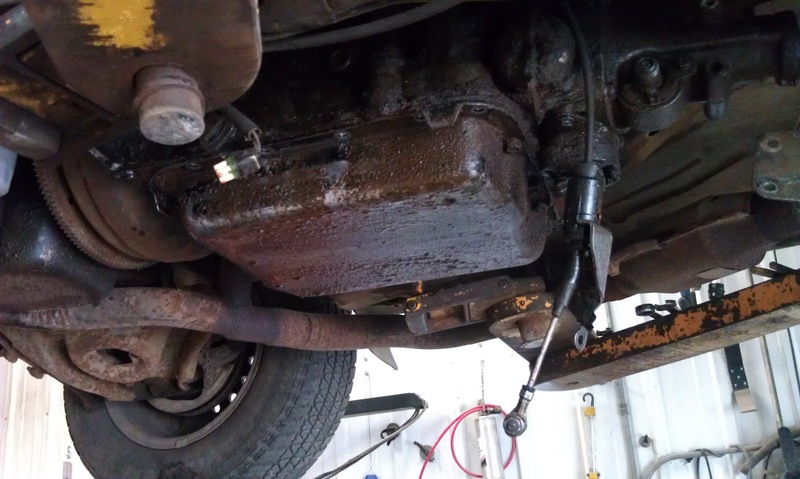 We unhooked the torque arm next. 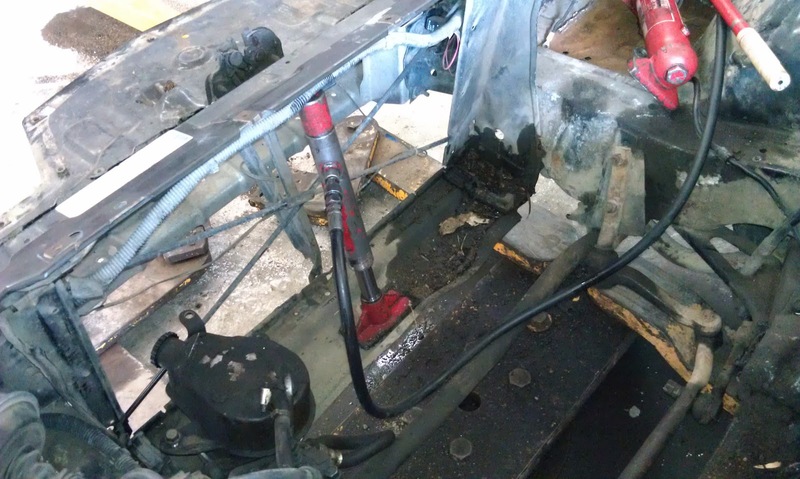 In this picture the torque arm is up and out of the way in the drive tunnel. 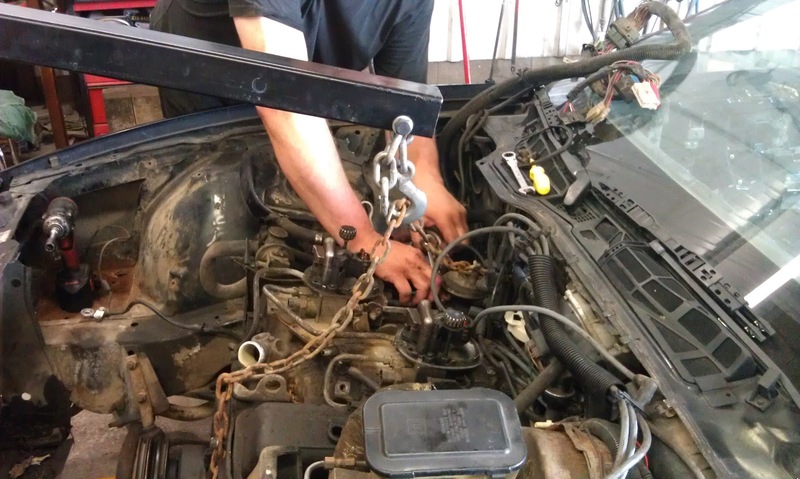 We unhooked the shift cable. 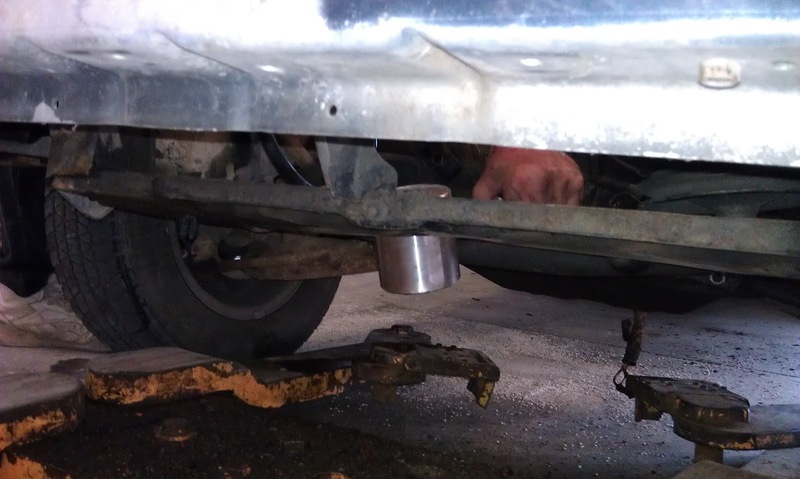 Next we unhooked the exhaust pipes. 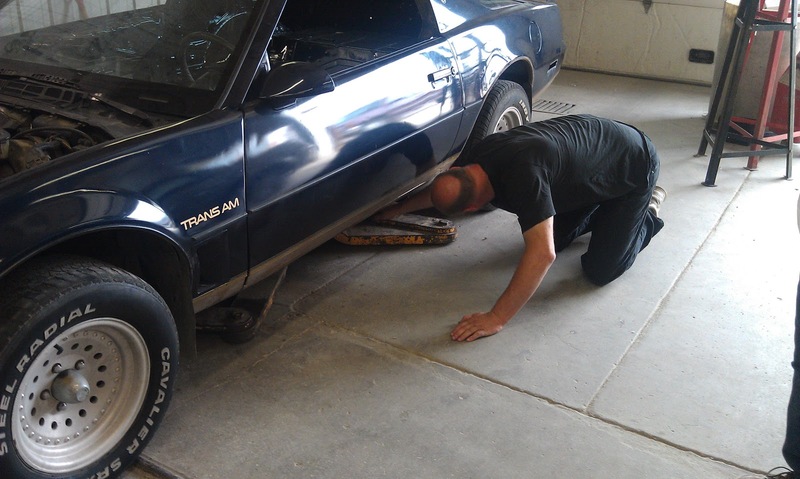 We had to cut the exhaust right in front of the Y in the rear before it splits to dual exhaust. 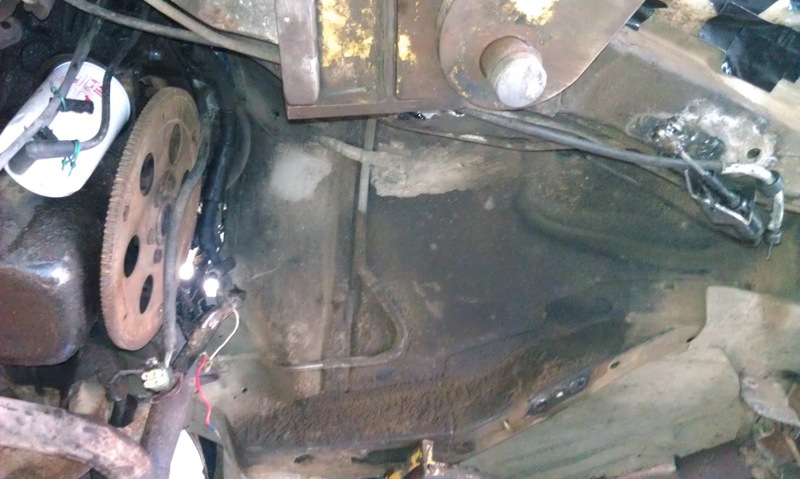 We removed this entire section along with the catalytic converter. 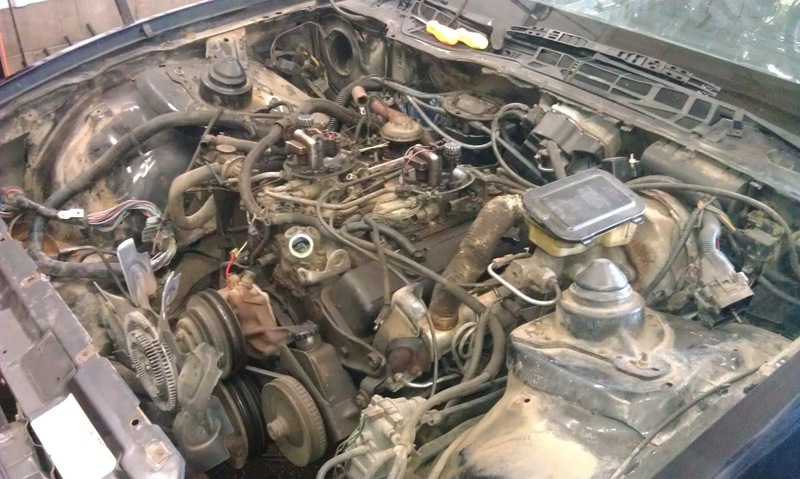 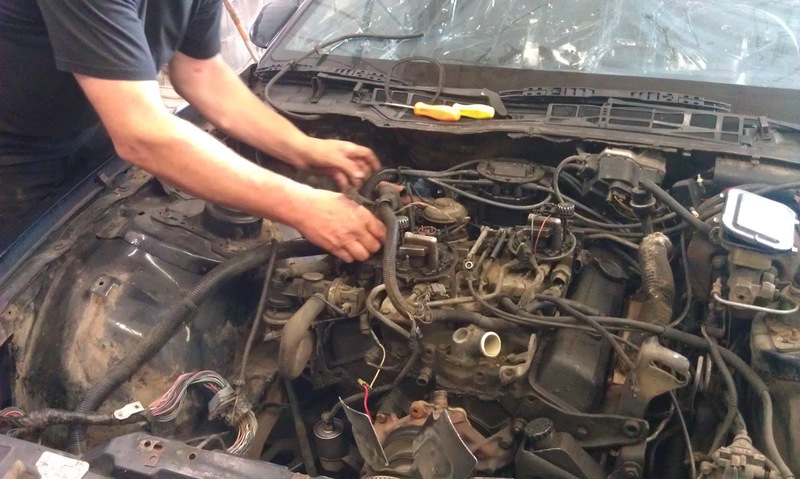 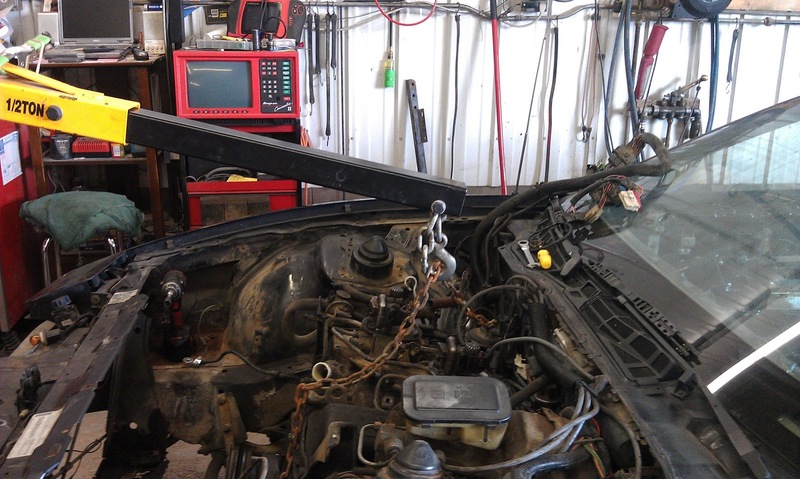 We moved more of the wiring harness out of the way and unhooked all the spark plug wires. 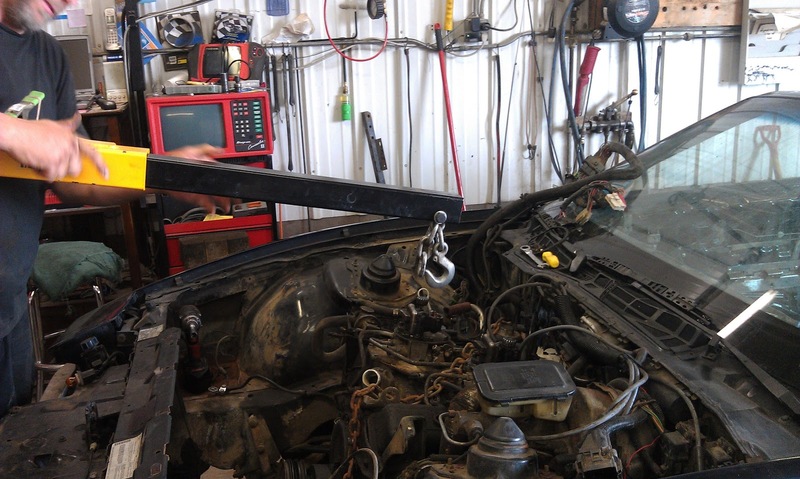 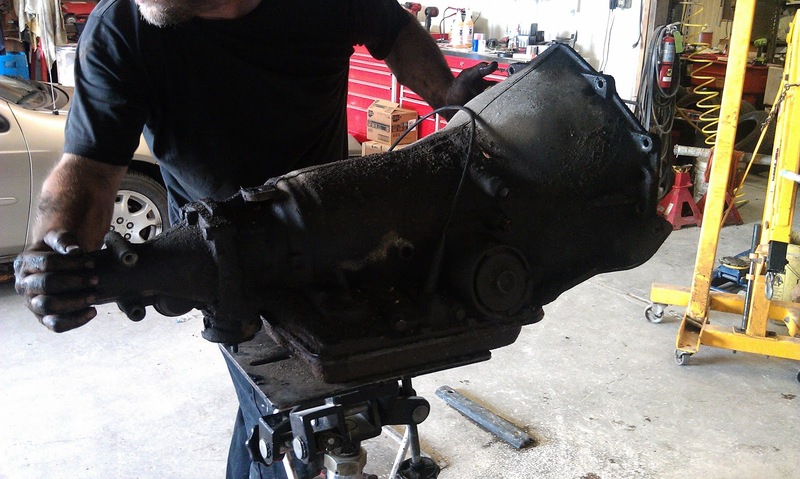 In this picture Troy is lowering the transmission down. 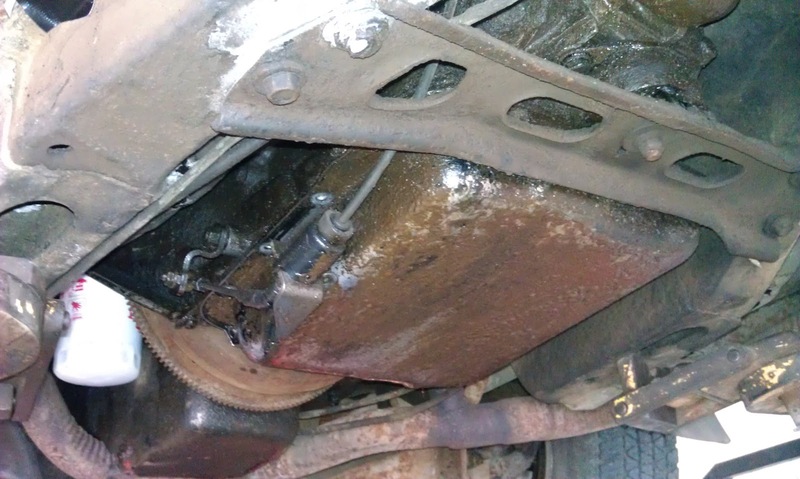 I need to get a new bellhousing cover because the previous owner apparently removed it and did not replace it. 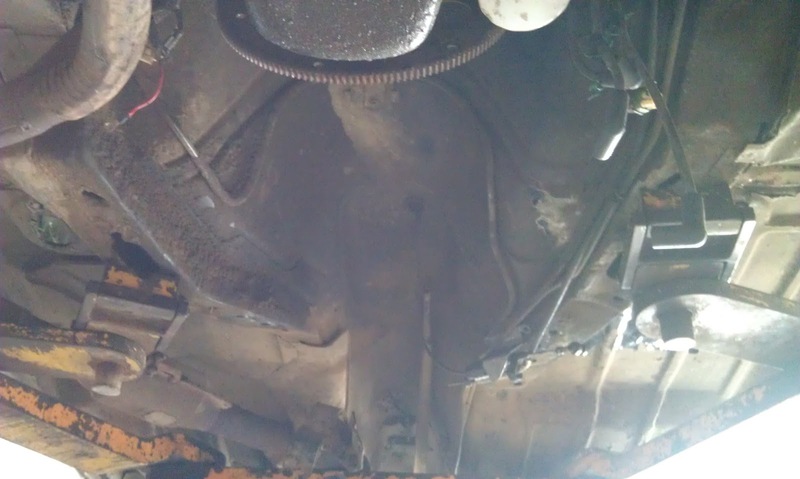 This is a picture looking down the drive tunnel from where the transmission was. 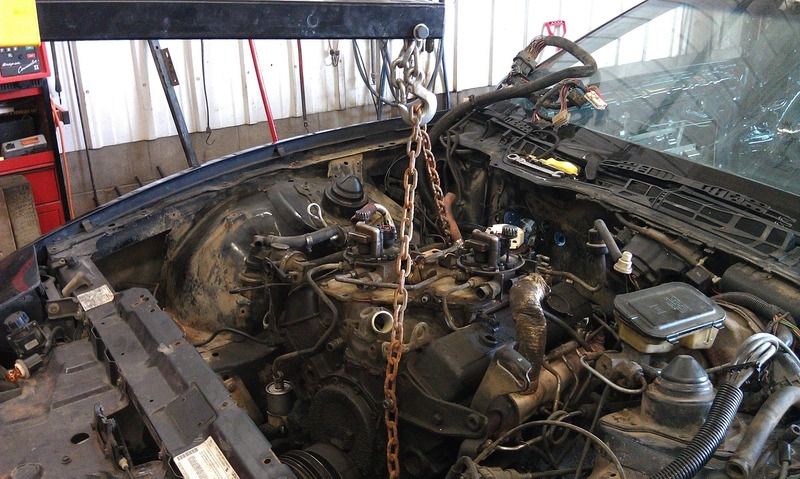 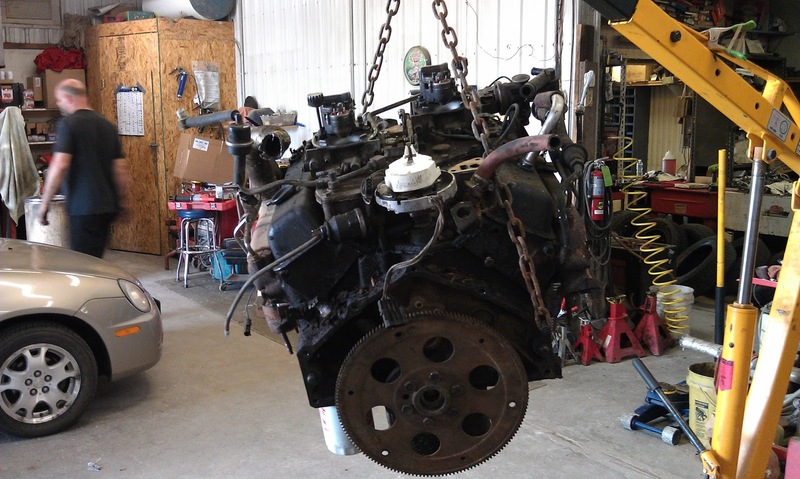 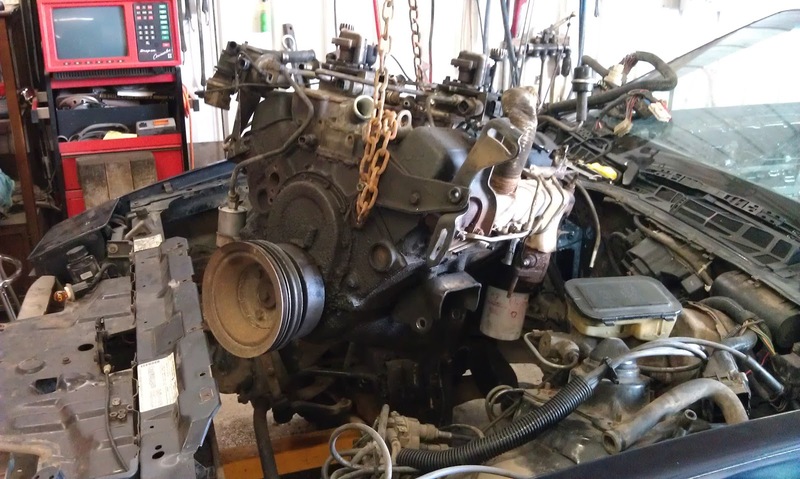 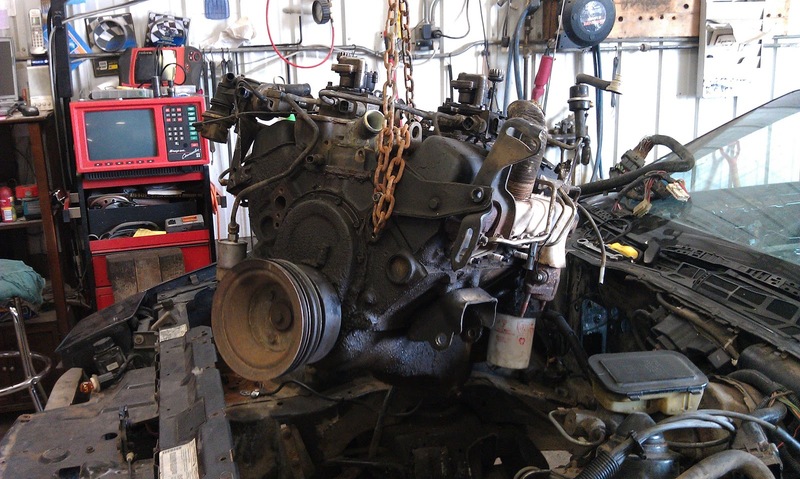 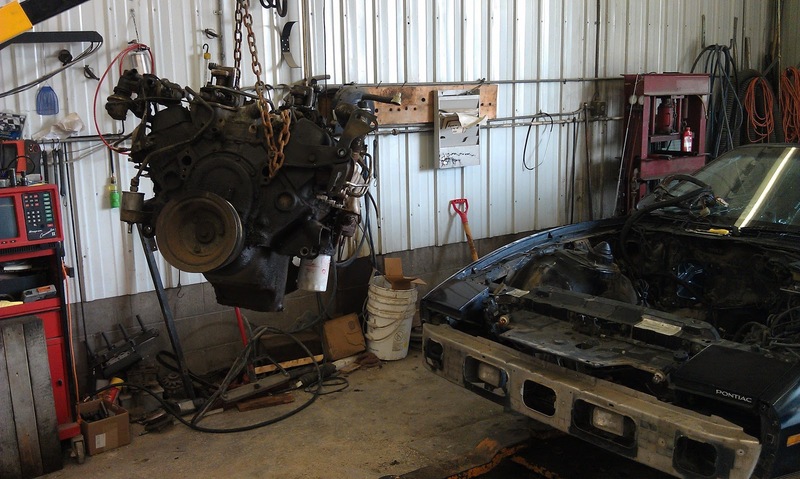 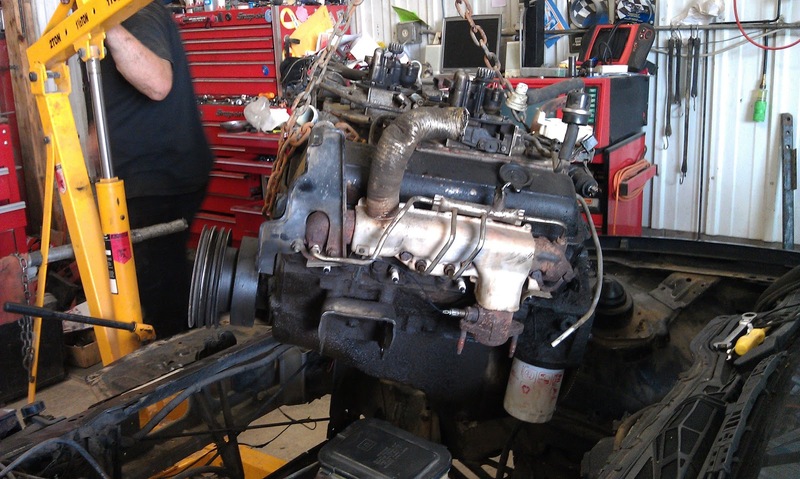 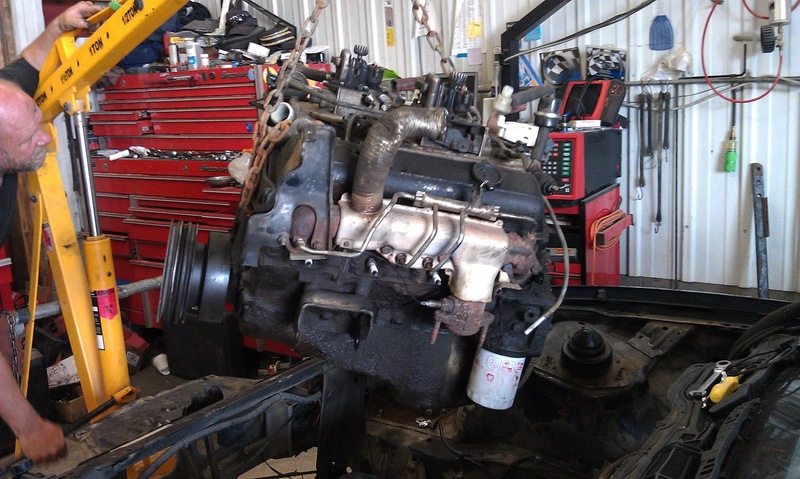 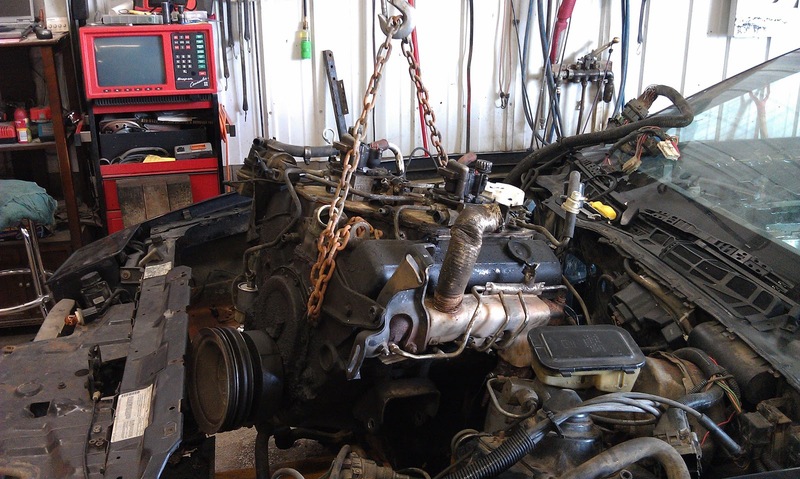 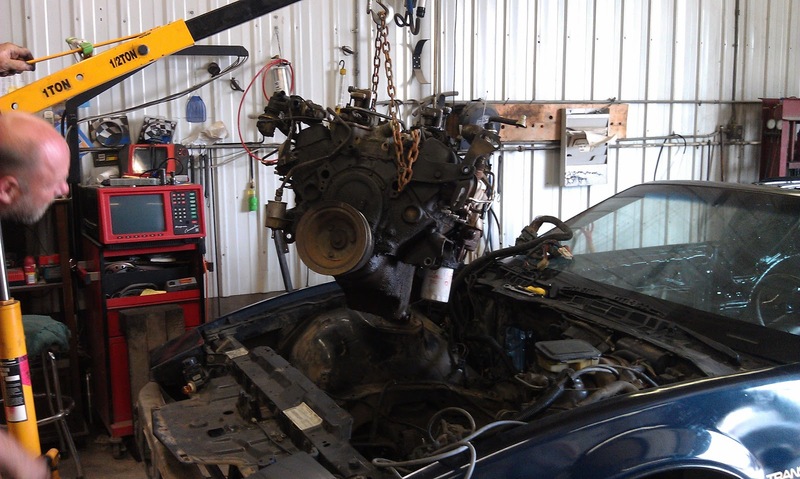 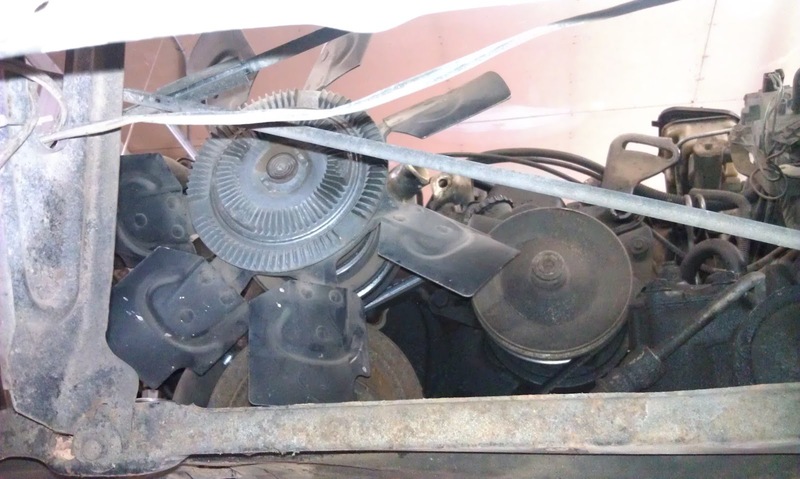 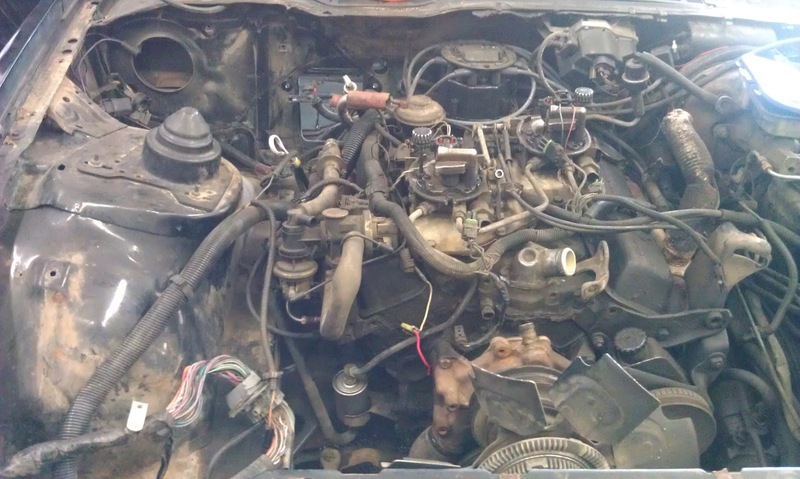 We got the rest of the wiring out of the way and hooked the chain on the engine block. 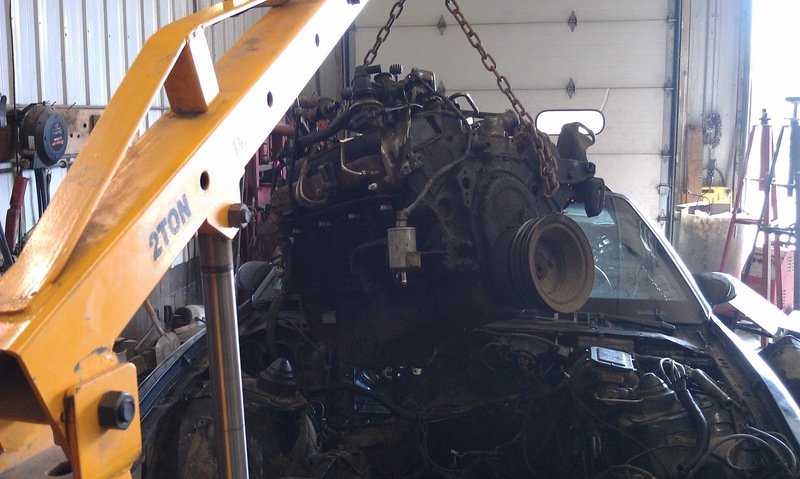 Troy rolled the cherry picker into place. 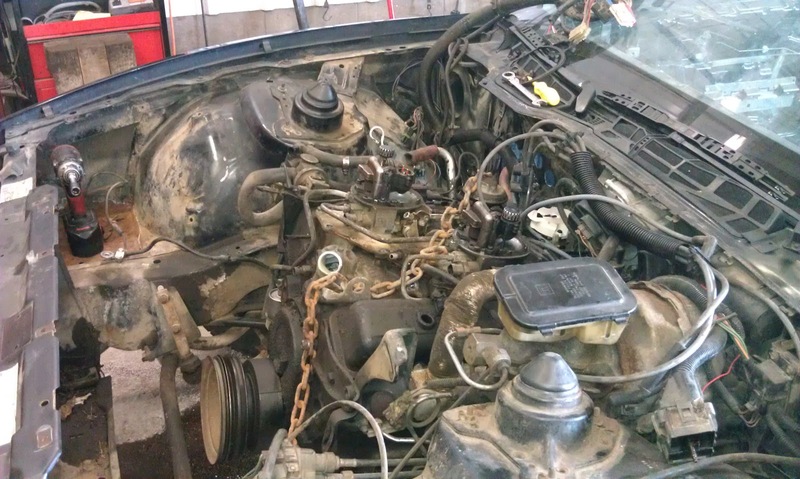 We needed to remove the EGR so the chain did not rub on it. 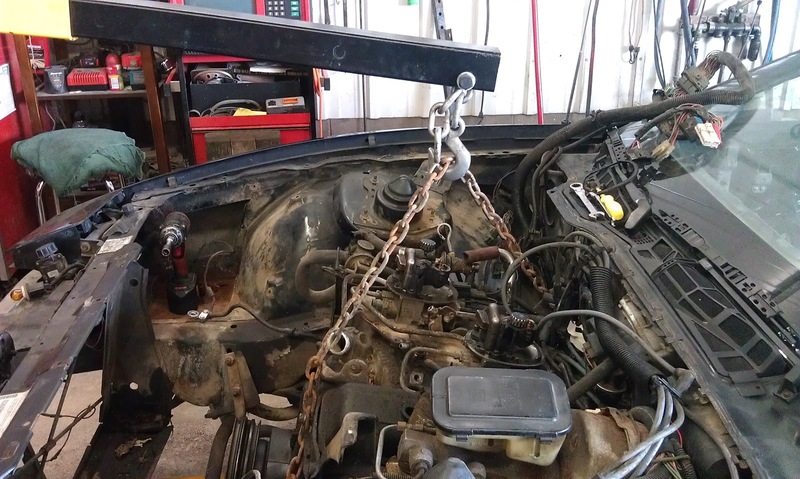 The chain is taut now. 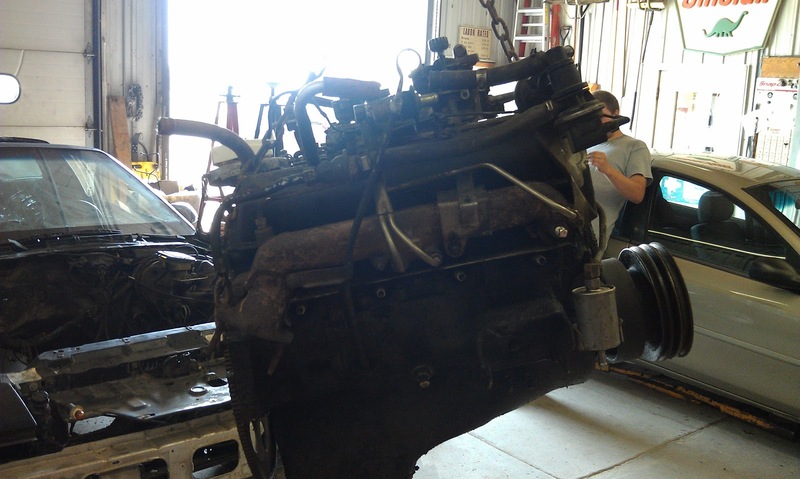 Here is a quick walk-around of the engine block. 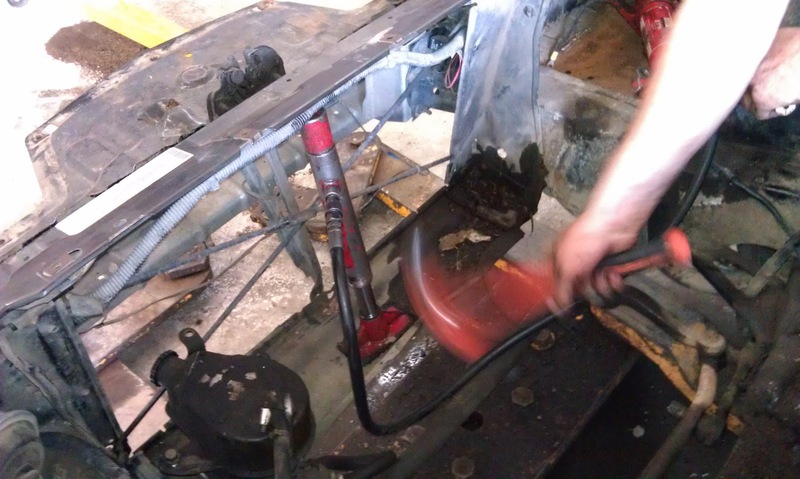 Next we attempted to straighten the lower radiator mount. 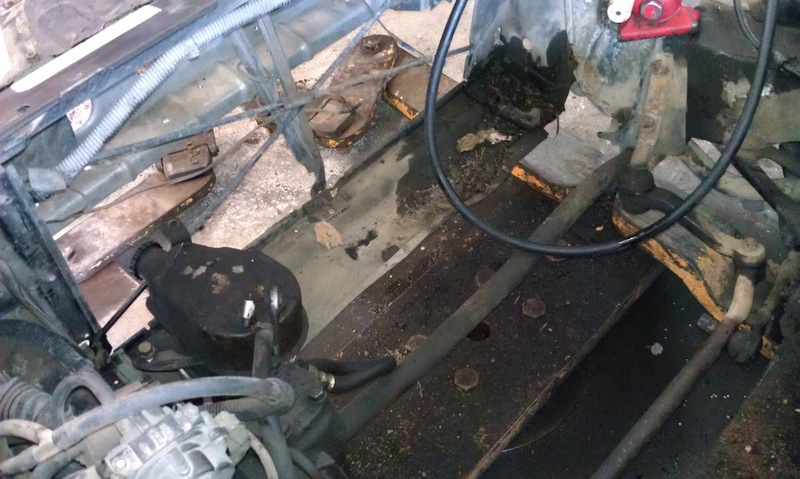 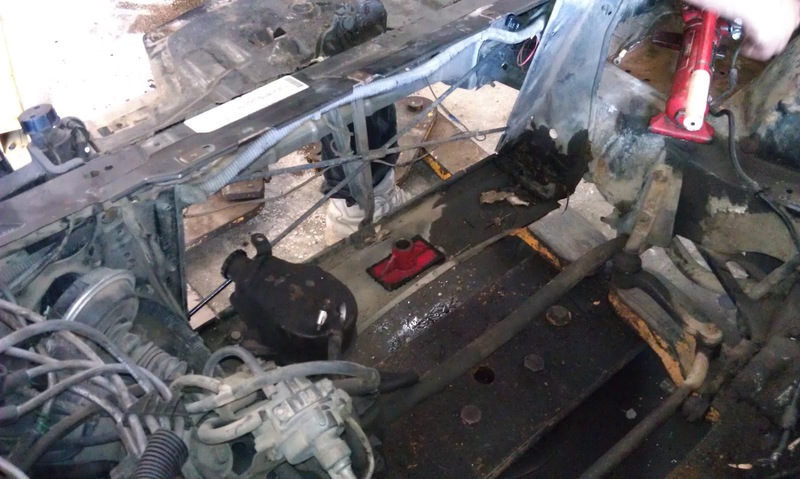 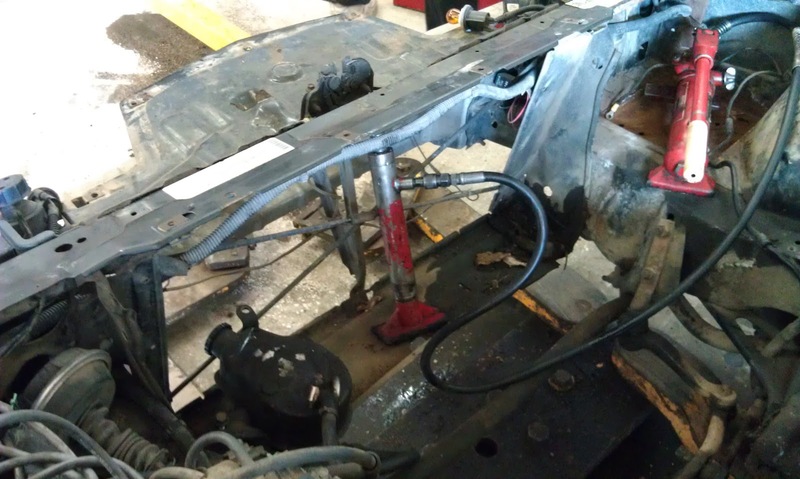 Here is a series of pictures as we worked on straightening the radiator mount. 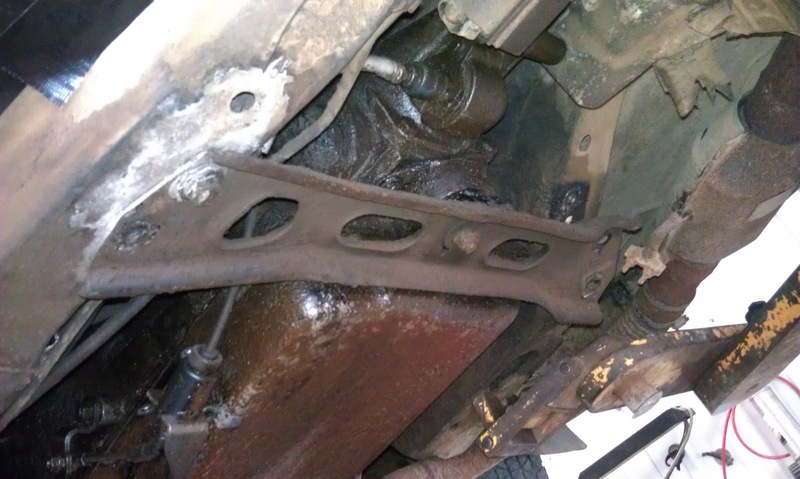 The radiator mount is straight again. 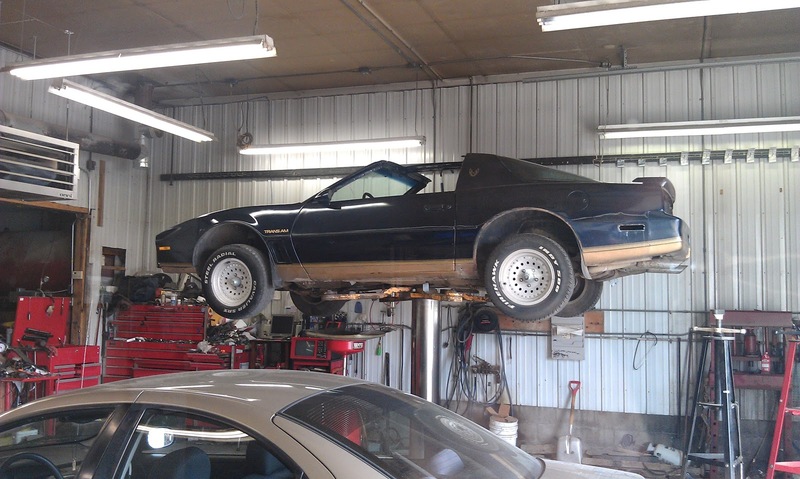 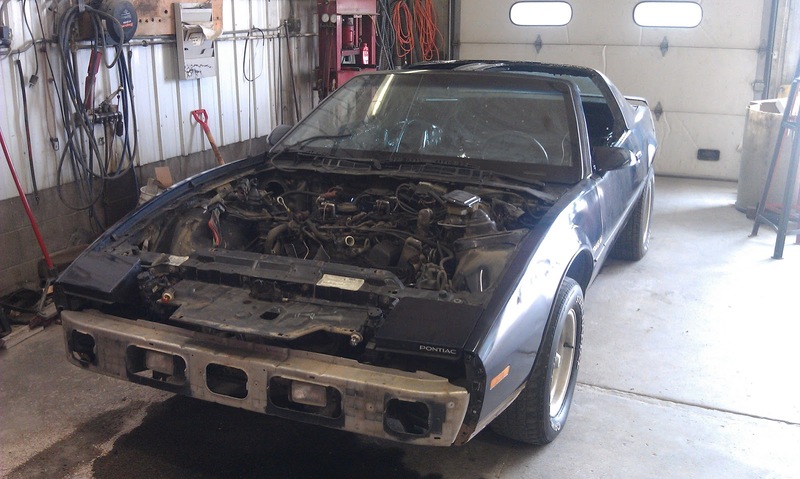 KITT sans engine and transmission. 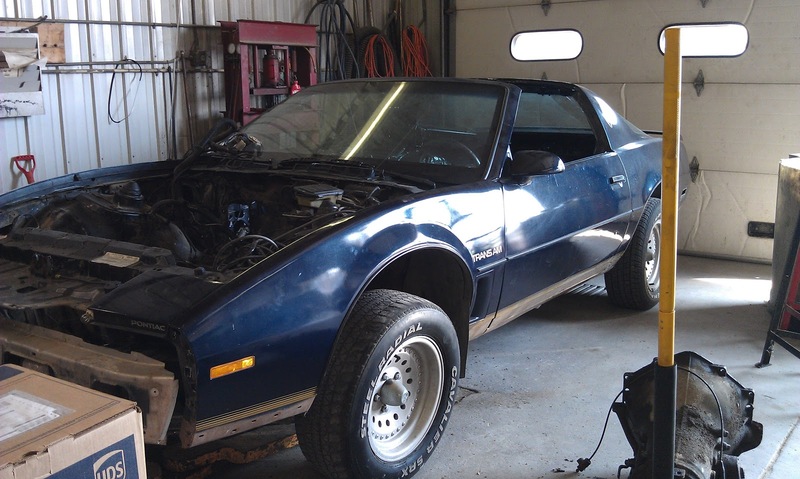 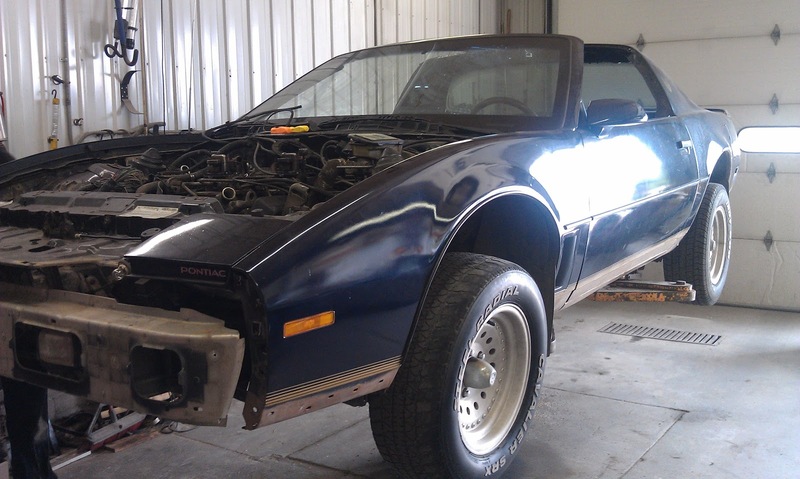 By the look of KITT's stance, it appears he is ready for some offroading action. 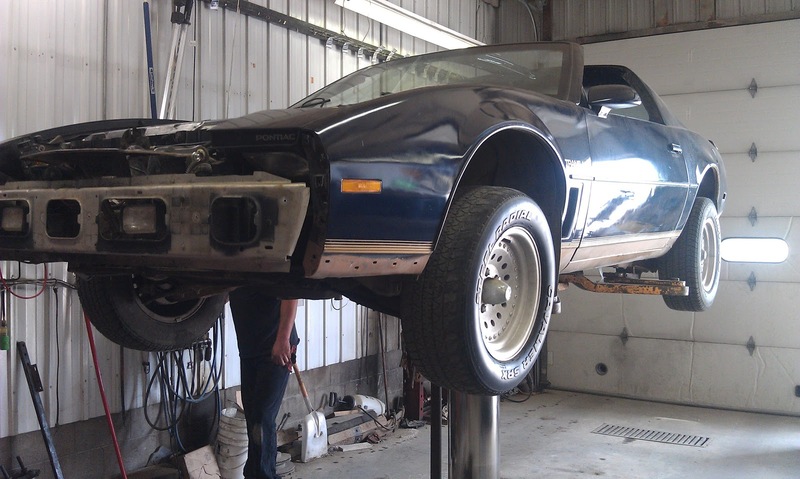 KITT is spending the night in the bay but will be home tomorrow.